- Camera, lens, filter wheel, are not included. - Focuser ring for Samyang 135 f:2 is not included by default in the bracket. Feel free to add this optional accessory. I put my order last sunday paypal number 7Y2471731L594524G and you don´t reply my emails asking about track order and shipping date.. I can print and send to you a 3-rings bracket by next Tuesday. The delivery time depends strongly on your local mail-service. Usually, it takes around 5 worked days to arrive to my spanish customers. 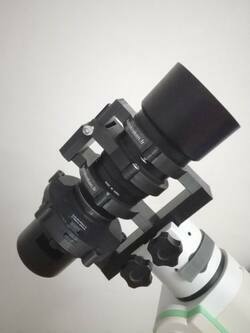 Hello, please let me know the delivery time for one 3-ring bracket (for ZWO ASI 78mm) & one focuser ring (for 135mm Samyang). Starting from the order, 3D-printing, assembling and packaging will take around 24 hours. Shipping in Europe takes around 6 worked day, depending strongly on your local mail-service. Is the dovetail PLA or metal? Thanks. The dovetail is made of PLA. Is it possible to temporarily remove the ring at the back and attach a DSLR? 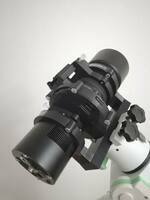 That way I get to use both my ASI1600MM-COOL and DSLR on the same rings. I know my camera rotation will be limited but that is not a major issue. Thanks. 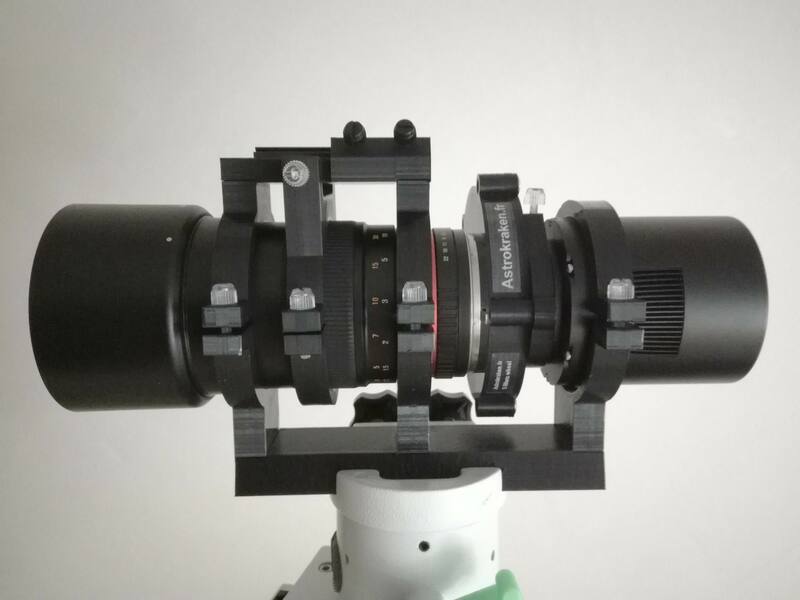 To check if the current version of the bracket fits Nikon lenses, please can you contact me on my direct e-mail address : leca.philippe@neuf.fr ? At the present time, Nikon version isn't available. When will this item be available to order? 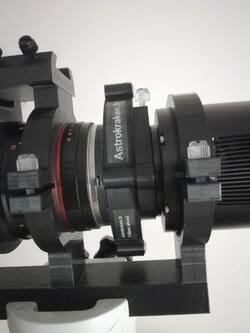 It seems it also accommodates a filter wheel. 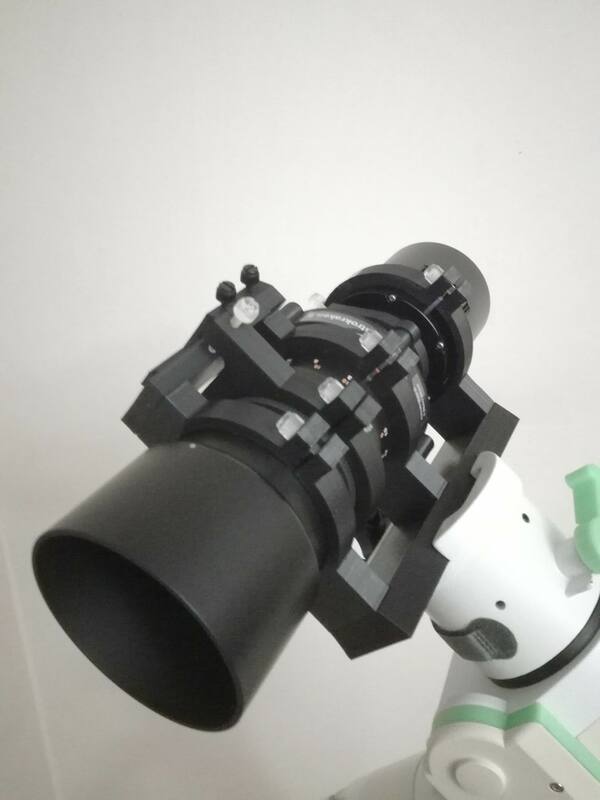 Will it accommodate 78mm diameter ccd?